Canisters are a great way to store and organize pantry staples, but they aren’t optimal for keeping food fresh. Even so-called “airtight” containers don’t work well, as they seal air in, which can oxidize and spoil the contents. Preserve your perishables with AirScape canisters: The patented system pulls air up, away from food through a one-way valve, and keeps it out with a locking lid. 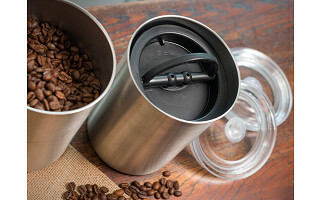 Made with a high gloss, commercial-grade stainless steel that’s scratch, stain, and odor resistant, the BPA-free canisters actually make a sound . . . hssssst! . . . as air is released. Clear lids let you track inventory, while a non-skid base holds the units safely in place. AirScape keeps crackers, cookies, and cereal crisp, while teas and coffee will retain their flavor, longer. 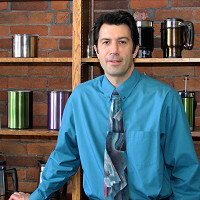 At Planetary Designs we cut our teeth creating products that improve upon the idea of the classic french press, and it wasn't long before we realized that the same concept could be applied to food storage, and the revolutionary AirScape Kitchen Canister was born. We value products that fuse the best of design, durability, and innovation, and we're thrilled to be featured on The Grommet today. @mary Yes, they are very easy to use, including opening and closing. There is a little resistance to the inner lid as the air is expelled. In terms of 'how much they hold', that's difficult to answer due to dry weight vs volume. A canister will hold more of a dense product like sugar. The AirScape will hold approximately 1 lb of coffee, and so they will hold even more than that with products like sugar and flour. An overall comment that I'd like to point out to everyone -- is that every time a canister or bag is opened, a new batch of food-destroying air gets inside. The only way to preserve stored contents is to remove the air after each use, and that's exactly what the AirScape canister does: Air is out, Fresh is in. We have a cabin on a lake. Will this keep my sugar from turning into one big lump? I've spent tons of money on all kinds of gadgets - NOTHING works. @Guest We've tested the AirScape using brown sugar to see how long it would keep it moist and fresh (and not turning into a brown sugar rock as brown sugar typically does after a few months), and after 9 months of keeping it fresh we decided it works REALLY well! Holds 1 lb. of whole bean coffee or large box of cereal - Can hold 64 fl oz. Just to add an interesting note about freshness and storing coffee -- we had a coffee roaster test our AirScape against freshly roasted coffee and it was 6 weeks before they could taste any difference. So each week they roasted the same coffee and compared it to what they stored in the AirScape, and week after week they could not taste any loss of freshness. @Scott Just out of curiosity -- was the AirScape opened and reclosed each day, like I would do with my coffee beans? It sounds more like it was opened once a week. Fair enough, but not my real-life experience. The description mentions "Clear lids let you track inventory", but I am confused, because the inner lid is black. I watched the video, to see if I was missing something, but am still confused??? You know what, never mind. I just realized, it does not mean tracking what is in the can, rather the quantity left. That's correct, you can view the approximate quantity remaining by looking through the clear lid on top. How does it work for ground coffee? Does the seal generate any static electricity when you pull it up making the ground coffee fly about? Just asking since I have this problem with my grinder and have to wait for a while before using the freshly ground coffee. Thanks. In our early development of the AirScape, we did have that issue with several different products. That led us to add a stainless filter (a fine mesh) into the air-valve. That solved the problem. There is always some level of static around moving small, light grinds of just about anything, but it's minimized with the AirScape. This looks like a great storage solution for coffee, but----is there no way everything doesn't have to be made in CHINA??? Personally, I always prefer to buy American-made products, even if they have to cost a little bit more. I agree with you. We frequently investigate our options for making products in the U.S. And we would gladly pay more to do so. However, the U.S. has lost much of its manufacturing capabilities and equipment around consumer products. Stainless steel is especially difficult (and in many cases impossible) to manufacture in the U.S., and plastic generally runs 2 to 3 times more for the molds, and usually much higher per unit as well. Many of the U.S. manufacturers we have contacted are not even willing to entertain taking on a new product. We're currently working on a much larger version of the AirScape for bulk storage, and none of the U.S. manufacturers we talked to were interested. Please also consider that while we really have no choice but to manufacture overseas (as with most consumer products companies), it still brings great value to the U.S., and also a number of good-paying jobs. Our little company now employees 15 people, and if we couldn't manufacture in China, we (and our jobs) would simply not exist. It'd be great if you could make a product like this with glass: it'd be perfect for preserving wine. I have a sample sitting on my desk :-) It will hopefully be available later this year or early 2015. AirScape seems like a good product. However, it is good for only ONE product at a time. $25 is a mighty sum to pay for storing one product. There should be a large discount for ordering more than one AirScape. It would also be a good idea to offer blank patch ons to label the contents! We are indeed working on having blank patches for labeling contents. As far as the cost, I can't argue that an AirScape is more expensive than most other regular canisters, but it's generally a 'get what you pay for world'. I can guarantee that we are charging a fair price based on the cost of manufacturing the product. I can also say that no one has yet told us that our product value vs price is out of line. I guess I would also argue that $25 is a relatively small price to pay for enjoying truly fresh coffee, cereal, almonds, brown sugar, etc, not to mention the cost of throwing out stale food. Someone contacted me a few months ago who has 9 AirScapes in their kitchen. Revolution is a strong word, but I really do believe that a few years from now, every modern kitchen will have a fleet of AirScapes to store all sorts of food items. Thanks for the feedback. I know the price for this canister may not work for some budgets, but it's the restaurant grade, stainless steel quality that warrants the price. Also - great idea on the labels. Canisters are a great way to store and organize pantry staples, but they aren’t optimal for keeping food fresh. Even so-called “airtight” containers don’t work well, as they seal air in, which can oxidize and spoil the contents. Preserve your perishables with AirScape canisters: The patented system pulls air up, away from food through a one-way valve, and keeps it out with a locking lid. 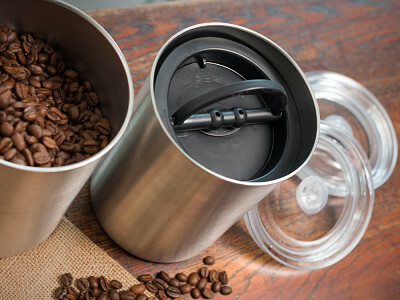 Made with a high gloss, commercial-grade stainless steel that’s scratch, stain, and odor resistant, the BPA-free canisters actually make a sound . . . hssssst! . . . as air is released. Clear lids let you track inventory, while a non-skid base holds the units safely in place.